Border towns and cities are strange places. They are part of, but uniquely different from their home country, members of one nation while being dramatically influenced by a neighboring one. For instance, the Hungarian city of Sopron bills itself as “the most loyal town in Hungary”, but its economic orientation is decidedly western, focused on Austria just a few kilometers away. Many of the citizens of Sopron work in Austria because the wages are much higher. A range of services – especially dentists – in the city cater to Austrians. There is little doubt that much of Sopron’s prosperity comes from its close proximity to a wealthy neighboring nation. 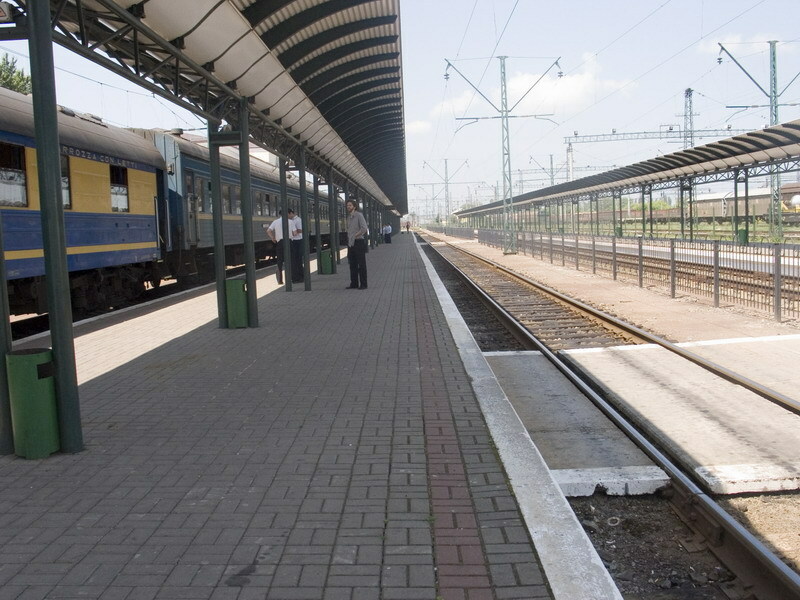 On the other end of Hungary there is Zahony, the last stop on rail and roadways before entering Ukraine. Zahony is a down at the heel, gritty border town where smuggling is an economic activity of note. Zahony sits on the south bank of the Tisza River which acts as the Hungary-Ukraine border. Cross the Tisza and a whole different world is encountered, starting with the first and westernmost town in Ukraine. The Ukrainian town of Chop would be an unmemorable place if not for its location on the border. There are many similar sized towns scattered across Ukraine which are totally anonymous to everyone except their inhabitants. Chop gets an outsized proportion of foreign visitors because it is a border crossing. Not only does it have a crossing with Hungary, but there is another one with Slovakia. The border effect is magnified by the fact that both of these nations are members of the European Union, a club that the majority of western Ukrainians wish their own country could join. The foreigners who come to Chop do not see the town, as much as they pass by it. Their experience consists of either going to Chop’s train station or sitting inside an automobile or train car waiting to travel further east or west. I have been in Chop on four separate occasions, never leaving the comfort of a train car. Despite this experience or perhaps because of it I have spent a fair amount of time wondering what Chop is really like. The town’s name had a lot to with my fascination. The name Chop is unforgettable. It evokes images of lumberjacks and butchers, not exactly the first thing that comes to mind when entering Ukraine. Of course, Chop is an Anglicization of the town’s name, changed from its original, Hungarian form of Csap. Chop took its name from the Csaps, a family of nobles who founded the town in the late 13th century. Long before Chop was an outpost on the Ukraine-Hungary border, it was riven by many shifts in geo-political fault lines. The town has changed hands over one hundred times in its history. During the 20th century it was buffeted by the winds of political change. Chop was part of two empires (Austria-Hungary and the Soviet Union) and one nation (Czechoslovakia) that no longer exist. The greatest influence on the town in the pre-Soviet era was Hungarian. A century ago the town was 99% ethnic Hungarian, that figure has dropped down to 39% today. Now as part of a struggling Ukrainian nation, Chop is at the mercy of Eastern European political tumult once again. On the Budapest to Lviv train I got my first view of Chop. From my compartment window Chop’s railway station looked vacant on the inside. Police and border guards were standing at attention outside it, looking as though they were waiting for something to happen. I always got the feeling that they were looking not so much to stop crime, as to take part in it. Many of the police were beefy, humorless types affecting a faux toughness. It dawned on me that if these are the people guarding the gateway to Ukraine than the country definitely has something to worry about. 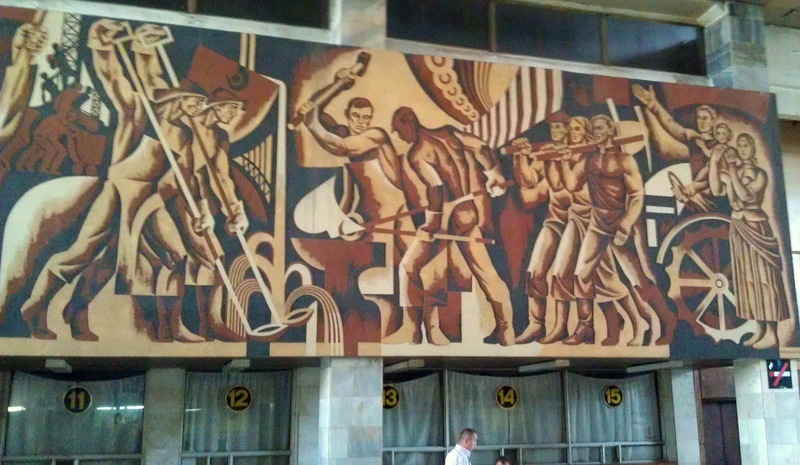 The interior of the railway station was most notable for a couple of large Soviet mural painting hanging above the ticket windows. These display the usual socialist-realism artwork of soldiers striding confidently into battle with weapons at hand, workers operating machinery with excessive pride and people marching vigorously toward a blissful future. In other words, the mural portrays the sunny side of communism, exactly the opposite of what people in places such as Chop and greater Ukraine experienced in their day to day existence. I only saw the backside of Chop’s railway station which faced the platforms. Later while doing research I got my first look at the entrance. I was surprised to find a neoclassical, columned entrance. The style of the station is classified as Stalinist-Eclectic, its façade giving a veneer of style and grace to an otherwise cavernous, concrete structure. 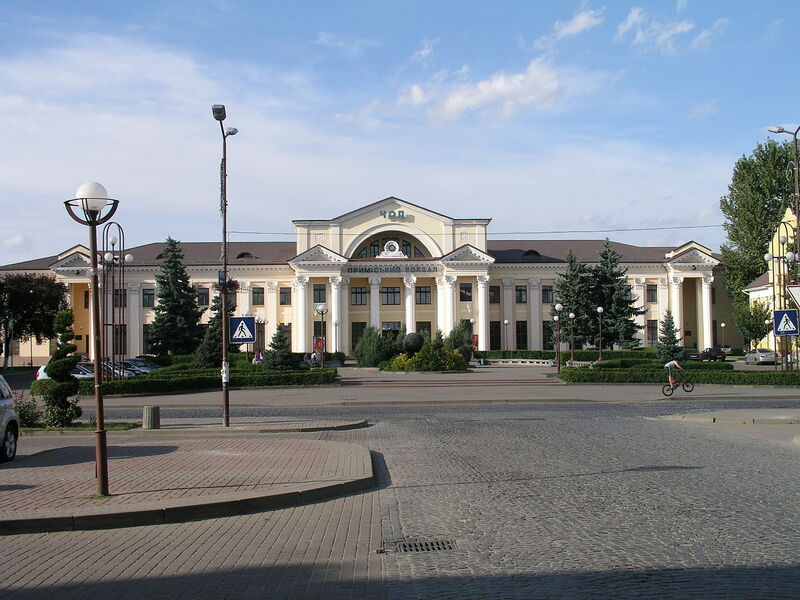 Joseph Stalin had more to do with Chop than just the railway station’s architectural style. He actually stayed there on his return from the Potsdam Conference at the end of World War II. He supposedly remarked during his stay that he liked the town. What that says about his aesthetic sensibility is anyone’s guess? From what little I have seen of Chop there is scarcely anything memorable about it other than a very large railroad yard with men preparing train cars to travel along the narrower gauge railway line in Ukraine. Because the wait takes many hours I have spent a considerable amount of time staring listlessly out the window wishing I could leave the train for a stroll around town. Unfortunately that is not allowed when taking an international through train. Thus I have always had to make do with a fleeting glance from the window when the train started back up heading further east into Ukraine. The most memorable feature of Chop for me was on the outskirts of town. It was another part of the communist legacy. A wooden guard tower stands close to the tracks. It must have been used as a lookout for border guards during the Cold War. From the top of it the guards had a bird’s eye view of anyone trying to escape from the Soviet Union. Today it stands empty, an austere monument to a time when Chop was the end of the line. This entry was posted in Hungary Travel (104), Ukraine and tagged Budapest to Lviv Train, chop ukraine, Cold War Border Control, Csap Ukraine, Joseph Stalin Potsdam Conference, Sopron Hungary, Tisza River Ukraine-Hungary Border, ukraine hungary border, zahony hungary by fortchoteau1. Bookmark the permalink.